A 5-reel, 25- payline native Indian dream; filled with symbolism and audio drum beats. ‘Shamans Dream’ is of massive popularity and it is clear to see why. The guardians of magic come to life in this highly graphic slot brought to you by Eyecon. This is a different slot with its own unique quirks and characteristics. A hit with all users and an overall fantastic playing experience similar to many other slots on MegaReel. The format on ‘Shamans Dream’ is exceptional and the storyline is authentic and engaging throughout. It would be a shame–man, not to try this fantastic slot. The return on this title is an average of 95.44%. Another unique and cultural beauty from the developers at Eyecon. The graphics on ‘Shamans Dream’ are outstanding, along with the storyline; which will really take you in. Megareel are proud to have this high quality and very popular title within our platform. 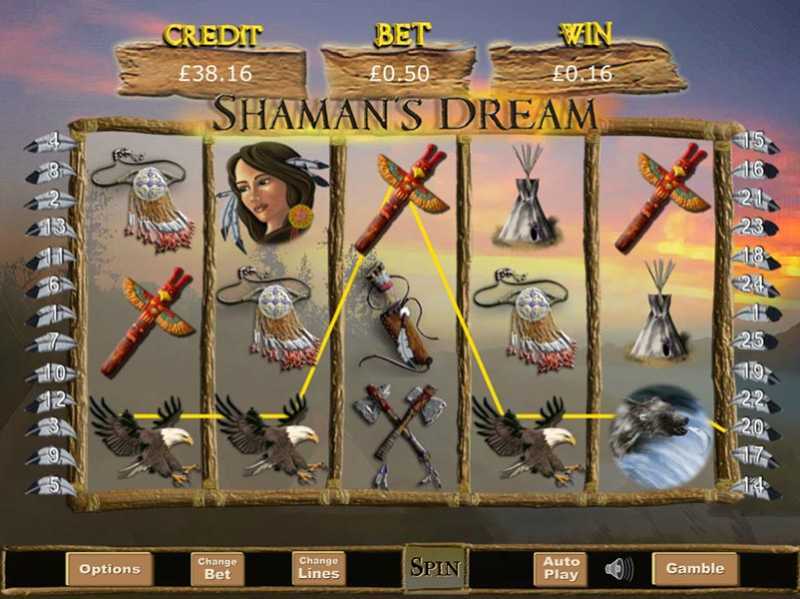 If you like this title, you may also like to try ‘Shamans Dream progressive slots’. Due to the intense popularity of ‘Shamans Dream’, Eyecon developed this as a follow-up; again, full of the same quality with an exciting progressive format. The Minimum bet on ‘Shamans Dream’ starts at 0.01 to a maximum of £25. There is a stake button allowing you to choose both your lines and the stake you wish to play. Alternatively, if you wish to take advantage of the AUTOPLAY function you can do so and watch the game take charge, whilst controlling your stake. Utilise the paytable to manage amounts throughout the game. THEME – this title is laced with Native Indian iconography and traditional storylines. The culture is implicit and explicit throughout, with a ‘reel’ feel for the magic of these Guardians. MULTIPLIERS – A very popular feature of this title is that the scatter wins are multiplied by the overall betting total! That really is magic and makes a massive difference to lower and higher stakes. WILD – the gorgeous and captivating ‘wolf’ is your wild. All wolf wilds will double your prizes and can substitute for any symbol (bar the scatter). SCATTERS – be sure to set your dreams floating within this game as the ‘Dreamcatchers’ function as your scatter. 3 or more of this scatter symbol will trigger the very exciting FREE GAMES feature within Shamans Dream. Dream Catcher wins will be multiplied by the total bet! FREE GAMES BONUS’ - Dreamcatchers triggering this feature award players with 15 free games and triple all wins. While this is exciting enough, players can also trigger a free game within a free game when a scatter combination shows up on the reels. This is a highly cultured and fascinating title from start to finish. It is not hard to see why there has been such a buzz around ‘Shamans Dream’ and as to why Eyecon released the progressive follow up title. This game is multi-device and mobile friendly can be played anywhere and by anyone; regardless of experience. 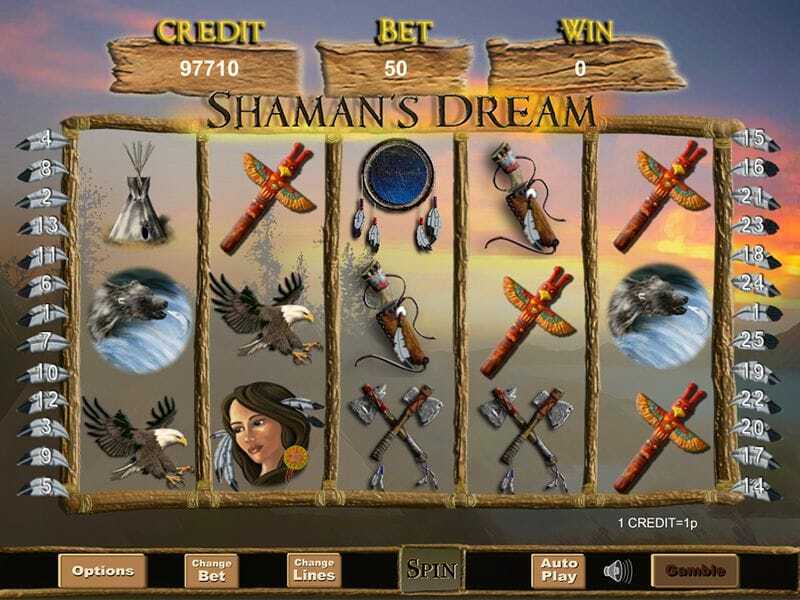 There's also jackpot version so try Shaman Dream Jackpot.